When we think about badminton, what’s the first thing that comes to mind? Datuk Lee Chong Wei of course! He brought the country into the spotlight with his badminton prowess and even managed to hold on to the title of No.1 badminton player in the WORLD before eventually conceding the spot. But as he takes a break now due to health reasons (and is recovering from it), other Malaysians have been hard at work trying to bring home the big prize to make our country proud once more! And it looks like that effort finally paid off! Goh Jin Wei, aged 18 has become the first EVER Malaysian to win a gold medal at the Youth Olympic Games (YOG) when she managed to pull off a surprising comeback against China’s very own powerhouse, Wang Ziyi in a series that went 16-21, 21-13, 21-19 shocking us all at how far we’ve come! 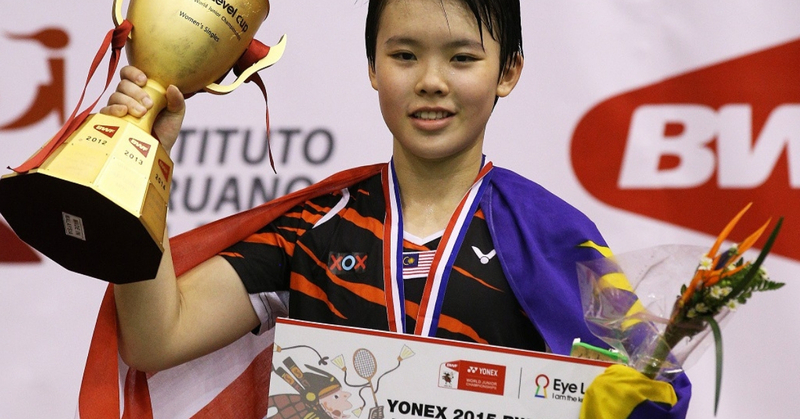 But little known fact is that with this win, Jin Wei not only becomes Malaysia’s first gold medalist at the Youth Olympic Games, but also the first ever professional player (Shuttler) to win both the world Junior Championships and YOG titles. She won the junior championship title back in 2015 when she emerged victorious in Lima, Peru. The Shuttler then revealed this: “I thought I would lose the second game, but I cut down on my mistake”, she told the Badminton World Federation (BWF) official website. She also said this: “The result will encourage me to keep working hard for the future”. But a fun fact would be that Jin Wei actually predicted this win back in 2015 while competing in Singapore’s International Series together with Cheam June Wei and Lee Ying Ying whom which visitied the Youth Olympic Park. And right there and then, under the Iconic five Olympic rings, Jin Wei declared : “I will play under the five Olympic rings symbol one day.” And it looks like she’s managed to do just that, as a few years later she managed to win the YOG and will now be training hard for the next big stage – the 2020 Olympic Games in Tokyo. We’re so glad you decided to keep on working hard to achieve your dreams! You’ve made your country proud, hero!